If you don’t have a preference for where your donation would go, we’ll choose the best spot for it. Just click the big blue Donate button to start the process. 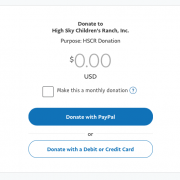 Here is what you will see once you click on the Donate button. All of our donations are handled via PayPal. We use the latest in technology to assure your donations are safe and secure. Outright Gift – An outright gift is a direct transfer of an asset to High Sky Children’s Ranch. Outright gifts may be made with cash, securities, closely held stocks, real estate, and tangible property such as art. Certain outright gifts qualify as a charitable tax deduction equal to the fair market value of your gifts. Charitable Gift Annuity – Generates a current tax deduction and provides a donor with fixed and guaranteed payments for life. Charitable Remainder Trust – A charitable trust entitles the grantor to an income tax charitable deduction in the year of the gift based on the present value of the remainder interest. Charitable Lead Trust – Provides an income stream to High Sky for a term of years with remainder to donor’s designated beneficiaries. May generate income, gift, and/or estate tax charitable deductions. 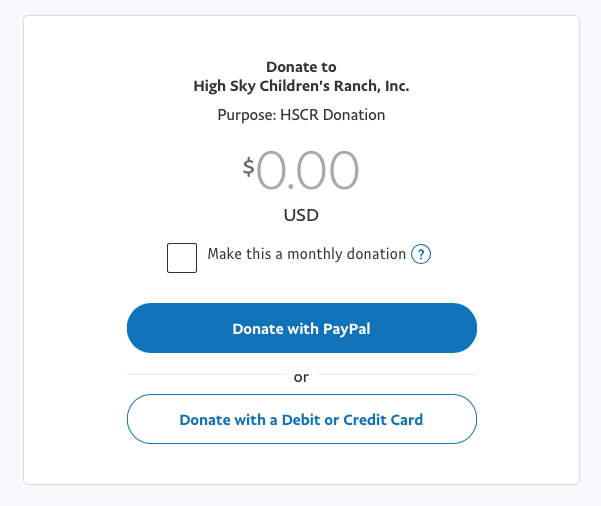 Life Insurance – By naming High Sky Children’s Ranch as an irrevocable beneficiary and owner of the policy, you may obtain an immediate tax charitable deduction of fully paid policies. Remainder Interest in a Personal Residence or Farm – Donor can obtain income and estate tax benefits by making a charitable gift of personal residence or farm and retain lifetime enjoyment thereof.